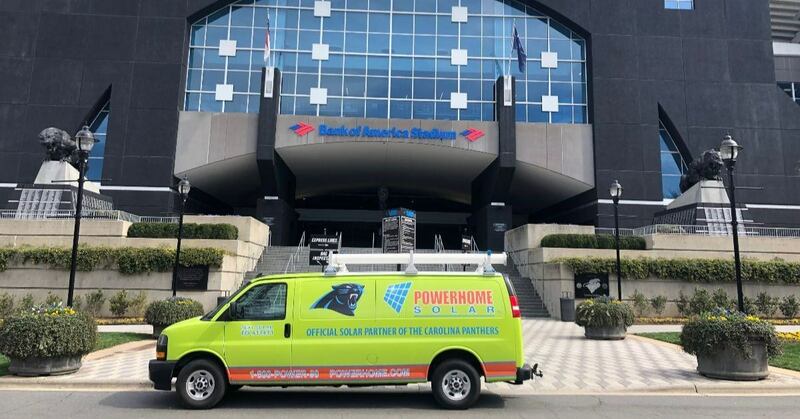 This week marked a big moment in the history of our partnership with the Carolina Panthers, as we installed solar panels at the team’s Bank of America Stadium in Charlotte, N.C., making the Panthers the third NFL franchise to have solar panels installed with help from POWERHOME Solar. Those driving by the stadium won’t be able to see the panels, which are installed on top of the north, south and east gates of the stadium’s arched entryways. But if you happen to live or work in any of the high-rise buildings near the stadium, you could sneak a glimpse at them. But you don’t have to do that. We can give you the up-close and personal tour of one of the arrays. What all went into the installations? POWERHOME Solar had two of its installation teams take part in this project, which will take three-plus days to complete. With eight members in each crew, over 400 hours were spent getting this project installed, and getting the Panthers prepared to help offset their energy bill. The project took two months of planning, and the end result looks to be a standout product. Why did the Carolina Panthers go solar? These new panels will help reduce the Panthers’ energy costs as well as the stadium’s carbon footprint. In 2018, the NFL joined the Green Sports Alliance to support sustainability efforts across the entire league. The Panthers join the Detroit Lions and Cleveland Browns who have gone solar at their respective team facilities with help from POWERHOME. The Lions had solar panels installed at the stadium’s parking garage and at team headquarters in Allen Park, Michigan last summer, while the Browns had solar panels installed at FirstEnergy Stadium in November. Part of POWERHOME’s deal with the Panthers was also to create a fun commercial involving some of the team’s players. Not only did that happen, but Panthers star center Ryan Kalil directed the commercial for us, which was a lot of fun. We gave you a behind-the-scenes look at the shoot in November. POWERHOME Solar, headquartered in Mooresville, N.C., is the No. 1 residential rooftop solar installer across its six-state footprint, and would love to help you go solar at your home. Solar energy is clean and affordable. When you pay off your panels, that energy is completely free to you. The environmental benefits of going solar are also a big selling point of switching. To learn more about whether you and your home qualify to go solar, we have a dedicated team that helps qualify homeowners over the phone. Please call us at 800-765-2715, and someone will be able to help you.